These ID security plates act as a theft deterrent and aid to item recovery. They are suitable for use on valuable equipment with flat surfaces including laptops and tablet computers. 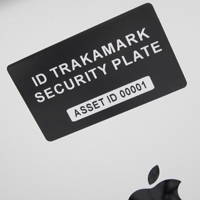 Each security ID plate is made from solid 0.5mm thick aluminium with hi-strength 3M adhesive making it near impossible to remove without damaging the equipment. Text and numbering are embedded in the aluminium and anodised on top to seal in and protect the image making them suitable for tough environments. 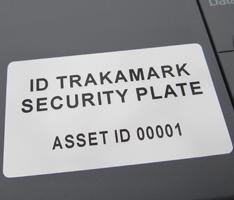 We recommend our customers include a warning message on their traka mark plates so that the equipment is traceable to the police plus a telephone number to contact if recovered. The addition of numbering and a barcode will also help you register details about each piece of equipment and can be highly useful if you should need to make an insurance claim. an economical solution – same durable quality aluminium. Protected with clear lamination to avoid message being rubbed off.